While on the first stop of their West Indies tour in Jamaica, England’s Womens cricketers, Danni Wyatt and Georgia Elwiss gave us an insight into what it’s like to travel the world to play international womens cricket. Read more below to find out what they think of the local food, their favourite sightseeing trip and how to train on the beach. Who’s the best and worst person to sit next to on long flights? Danni: Sophie hates flying, but if its fine, I like sitting next to her too as she’ll entertain me! Georgia: I’d sit next to you [Danni] as you’d entertain me if it’s a good calm flight, otherwise you’d be a nightmare. Who’s your favourite person to room with? What has been your favourite country to tour? Georgia: I like Australia because the culture is similar to ours, but it’s a hotter climate. Danni: For me Australia, then India –I love its food and culture, the people there are amazing too! Do you have any lucky items that you take with you? Georgia: I have a little cuddly toy – I always take it away with me, it’s my good luck charm. Danni: This tour my mum put a photo of me and my dog in my kit bag, which I found. Georgia: Ah that’s so cute of her. What item of food can you not live without when you’re away? Georgia: Chocolate. Everybody needs a bit of chocolate. Do you get to try the local food? Danni: I try and get out of the hotel to eat different food. Georgia: Especially in India and Sri Lanka, the food there is so good. Do you get any spare time to do any sightseeing on tour? Georgia: Yeah, we definitely always try to get out and experience the local culture, but it ultimately depends on the security advice we are given. In South Africa at the start of this year, we went up Table Mountain in Cape Town, and during the World T20 in India, we got to meet the Dalai Lama, which was amazing! Danni: It’s good to have a balance when we’re away; time away from cricket does us good, and it’s great to see some of the country. Do you or the team have any pre-match rituals? Georgia: Not really – some of the girls like to get to the ground two hours ahead of the start, but it’s quite relaxed at the moment. Danni: I have to do a Sudoku puzzle before every game. We saw you training on the beach. How did that compare to your usual in-ground training? Danni: That was so much fun. If you can field on a beach then you can field anywhere. Georgia: It’s different to what were used to. We had to make the best of the conditions and, actually, if you can pick up a ball on the sand then you can pick up a ball on the grass! Do you get time between training and matches to play any other sports? Danni: We played volleyball the other day and we’ve just started playing football as part of the training… it’s started getting serious now with referees and linesmen. What’s been the highlight of the tour so far? Danni: It’s quite early on, so we haven’t actually played any matches yet, so it would have to be beating the West Indies girls at beach volleyball! Georgia: I’ve never been to the West Indies before so it’s just been great to sample the culture and meet the people – they’re so friendly and welcoming here. The facilities here are amazing. What home comforts do you miss most when on tour? Danni: I miss my dog. What will be your first meal you have when you get home? Danni: Corned beef pie with peas and gravy, my mum always makes me that. Georgia: Something traditionally English like a shepherd’s pie or something simple like beans on toast – just a good home-cooked meal. A host of your favourite England players have been surprising customers across the country by making Waitrose shopping deliveries. 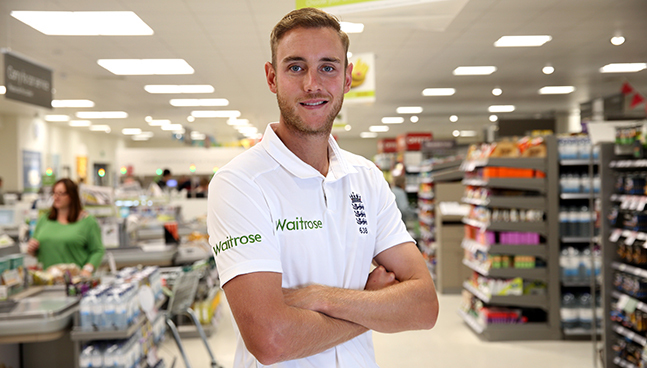 Watch how the likes of Chris Woakes and Jonny Bairstow got on helping out in their local Waitrose stores.